Brandy Borne’s eccentric mother, Vivian, has been invited to perform her one-woman show of Macbeth at the hamlet of Old York’s Brit-flavored annual fête. Brandy, sensing a dramatic disaster, and savvy shih tzu Sushi, sensing doggy treats, tag along. Before the curtain goes up, an unscripted death occurs onstage. When a second victim makes a too-hasty exit from the mortal coil, Brandy and Vivian must step into the spotlight. But a calculating killer seems to be well-rehearsed for the Borne girls . . .
Don’t miss Brandy Borne’s tips on antiques fairs! BARBARA ALLAN is the joint pseudonym of acclaimed short story writer Barbara Collins (Too Many Tomcats) and New York Times bestselling mystery novelist Max Allan Collins (Road to Perdition). 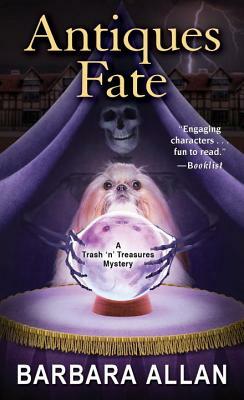 Their previous collaborations have included one son, a short story collection, and eleven novels, including the 2008 winner of the Romantic Times Toby Bromberg Award for Most Humorous Mystery, Antiques Flee Market. They live in Iowa in a house filled with trash and treasures. Learn more about them at www.maxallancollins.com and at www.barbaraallan.com.